After six months of hemming and hawing, the Senators traded superstar defenseman Erik Karlsson to the Sharks on Thursday, freeing him from the organization’s perpetual state of dysfunction. The slow burn became the NHL’s most exhausting summer saga. From March, when the Karlsson rumors first reached serious levels ahead of the trade deadline, through a nasty locker room scandal and all the conjecture in between, it played out like a car crash in slow motion. Ottawa’s newly stated rebuilding “plan” didn’t include the two-time Norris Trophy winner and face of the franchise, who can become an unrestricted free agent following this season. And the Sharks with GM Doug Wilson, left at the altar in the John Tavares sweepstakes, sought a big splash to counter division-rival Vegas’ trade for Max Pacioretty and remain in the Stanley Cup conversation as a Western Conference power. Now that #KarlssonWatch is completed, it’s fairly plain to separate winners from losers. Let’s hand out the grades. Whether Karlsson’s acquisition alone raises San Jose to the same pedestal as Nashville, Winnipeg or Vegas remains to be seen. But Wilson, regarded as one of the NHL’s shrewdest executives, wasn’t keen to sit on his laurels this offseason, and the roster is undoubtedly improved from 2017-18. Instantly, Karlsson creates a defense corps that should be the most dangerous in the NHL in terms of jumping into the play and driving possession. The group already includes 2017 Norris Trophy winner Brent Burns, routinely among the NHL’s select few to challenge Karlsson’s point output, and Marc-Edouard Vlasic, one of the game’s best shutdown defensemen. Only Nashville (P.K. Subban, Roman Josi, Ryan Ellis) and Tampa Bay (Victor Hedman, Ryan McDonagh, Mikhail Sergachev) can compare. The benefits of adding Karlsson, who’s coming off a down season with 62 points, extend to all corners of the ice. The 27-year-old should also enhance San Jose’s talented but aging group of forwards. Joe Pavelski (34), Joe Thornton (39) and Logan Couture (29) are still highly productive, having driven the NHL’s 13th-ranked offense last season, but have passed their primes. Consider Karlsson (28) and Evander Kane (27) as reinforcements intended to take the team back to the Stanley Cup Final. The Sharks’ window to win is now, as Wilson’s pair of high-risk trades in the last five months have signaled. He won’t make a pick in the first round until 2021 (and possibly 2022, if San Jose reaches its intended destination). But otherwise, it’s come at a relatively low price in terms of NHL talent. The cost of adding Karlsson was always going to be steep. Vegas (Cody Glass), Dallas (Miro Heiskanen) and Tampa Bay (Mikhail Sergachev) — San Jose’s three main competitors in these sweepstakes — all balked at parting with their best bargaining chips. Somehow, Wilson managed to keep his, too, hanging on to young NHLers Timo Meier and Tomas Hertl, as well as top prospect Ryan Merkley. Keeping Karlsson away from the Golden Knights, who added Pacioretty three days earlier, is another win. 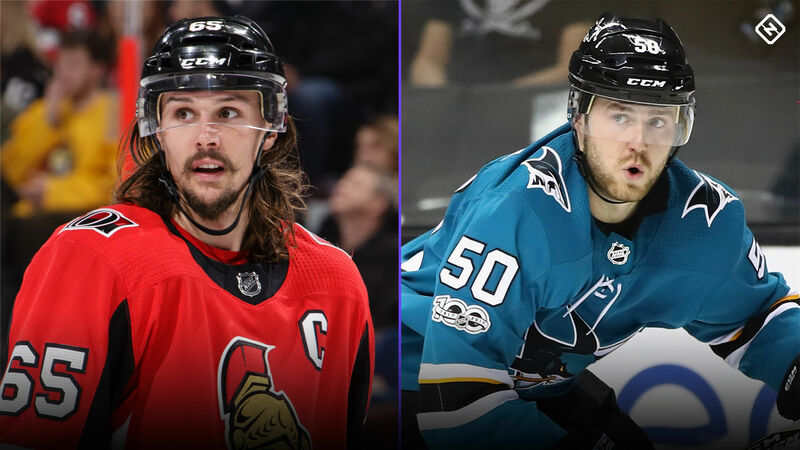 The success of this trade ultimately depends on Karlsson signing an extension to stay in San Jose, a question he avoided Thursday while speaking to the media. The Sharks are projected to have more than $25 million in salary cap space for the 2019-20 season — plenty of flexibility to give Karlsson the contract he deserves, money he couldn’t get from Ottawa. To be fair, the Senators were never going to grade out above a “C” in any deal ridding the roster of Karlsson unless they discovered a way to recoup talent equal to arguably the NHL’s most dynamic defenseman, in his prime. That wasn’t the intent anyway, as Pierre Dorion, under the direction of penny-pinching owner Eugene Melnyk, has declared full rebuild mode for the franchise. Trading its face of nine years officially ushers in the overhaul. In short, the damage was done long ago. Karlsson wasn’t sticking around beyond 2019, no matter what he says, and the low-ball contract offer was icing on the cake. Dorion’s only hope to save face was to not completely botch negotiations. He didn’t, if that’s any consolation, but Chris Tierney isn’t filling the Canadian Tire Fire Centre next season (or ever). Neither he nor any player included in the return will inspire confidence. Notably absent is a premium prospect with star capacity the team might one day build around. At present, Ottawa doesn’t own a first-round pick in the 2019 draft. It belongs to the Avalanche thanks to Matt Duchene. And with the Sens primed to finish atop the lottery heap in 2018-19, it’s likely Ottawa looks on as Colorado drafts the type of franchise pillar it now so desperately seeks. The first-round pick Dorion did acquire can be used in 2019 only if the Sharks improbably miss the playoffs. Most likely, it will defer to 2020, when San Jose still should be competitive enough to keep the pick out of the lottery. The 2021 second-rounder (which can be upgraded to a first if the Sharks reach the Stanley Cup Final in 2019) only goes to Ottawa if the Sharks re-sign Karlsson. Interesting condition on Karlsson trade: If he appears on the reserve list of any Eastern Conference team this season, SJ must send another first-round pick to OTT by 2022. Beyond Tierney, a 24-year-old coming off a career-high 17 goals and 40 points, the rest of the players headed to the Senators are relative unknowns. According to SN contributor Steve Kournianos, Josh Norris, a first-round pick in 2017, and Rudolfs Balcers rated second and third in the Sharks’ 30th-ranked farm system. Dylan DeMelo, a fifth-round pick in 2011, played 63 games with the Sharks in 2017-18 and is a fringe NHLer. Dorion was unable to get his hands on Meier or Hertl, and Ryan’s contract is still on the books. Those are definite missed opportunities that could have boosted the embattled GM’s standing as one of the NHL’s most pliable executives. None of this was enough to avoid further alienating an already disgruntled fan base. Is Mark Cavendish in the 2018 Tour de France? And what other British riders are in cycling’s showpiece race?